When I was a kid, I thought lotion as a birthday or Christmas present was kind of neat because of all the interesting scents. As an adult, I’ve realized that a bit of nice lotion as a fall or winter present is so much more than something nice to smell – it’s exactly what your hands and body need! 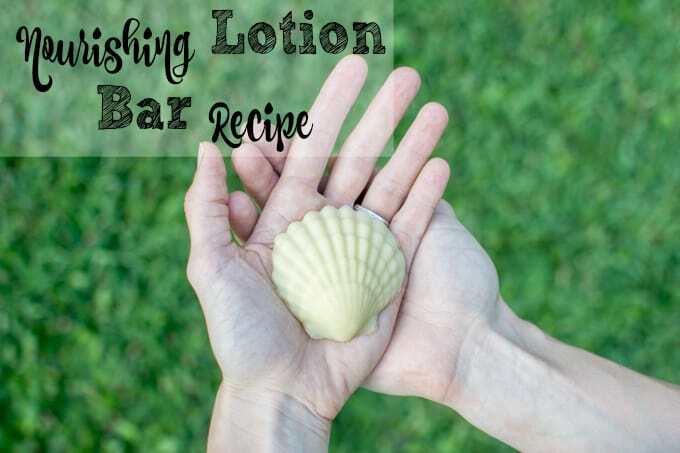 Today’s tutorial is a recipe for scrumptious, beeswax free lotion bar. Because high quality beeswax can be difficult to find and/or expensive, this recipe is beeswax free! It uses very few ingredients, is easy to customize and, perhaps most wonderfully, it smells like chocolate. What’s not to love? * Because this recipe is built around a base of 100 grams, it is easy to scale up! You can create a large batch and then have some amazing, unique handmade gifts for friends and family. * You will need either sweet almond oil or fractured coconut oil, but only a small amount. 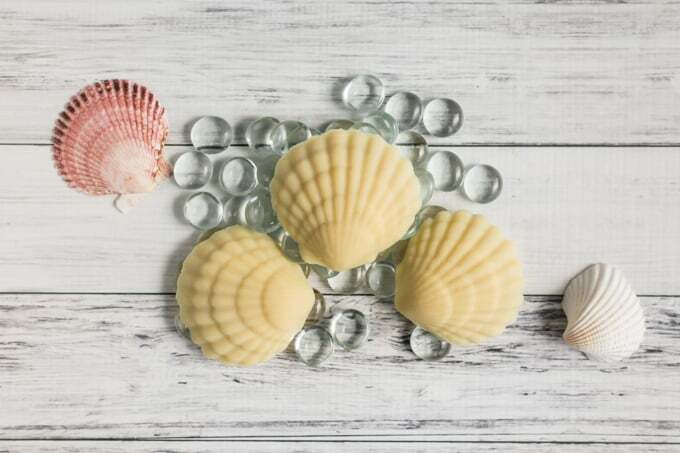 If you plan to use your lotion bar somewhere hot, consider omitting the oil entirely. If it’s cold out, add just a drop or two. 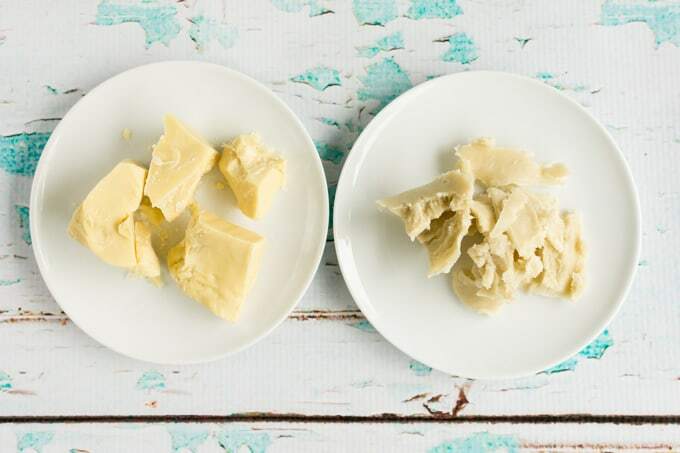 Both cocoa butter and shea butter are solid at room temperature, but have low melting points. When it’s cool, the added oil helps the lotion bar melt slightly in your hands for easy application. As regular readers know, we live in Hawaii and don’t have air conditioning. 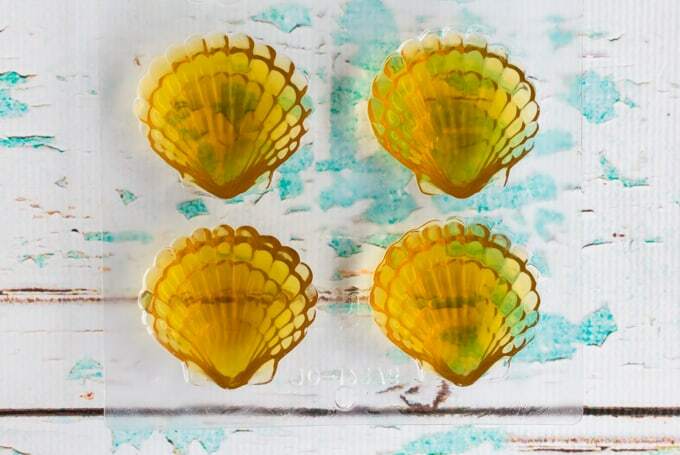 When I make these lotion bars with a couple drops of oil, they will not melt sitting there at room temperature but will visibly start to melt in my hands. * You have a lot of choices when it comes to molds. I like to use candy molds and they work really well, especially silicone molds, but you can also use ice cube trays or cupcake liners. 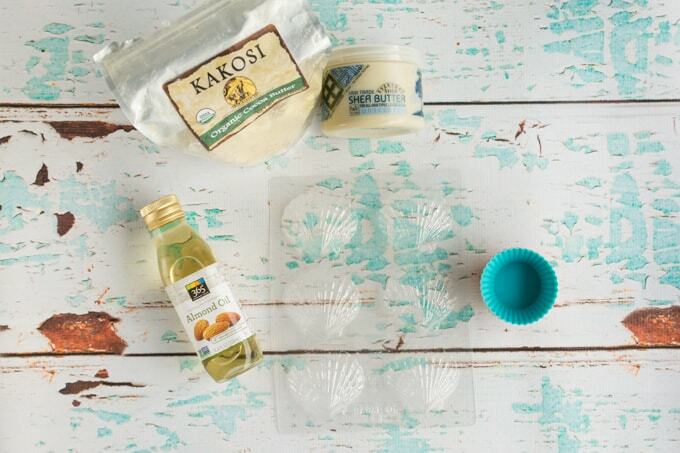 Silicone cupcake liners are better than paper liners because the oil tends to leak through paper. If you need to use paper cupcake liners, make sure to double them up! 1. If you haven’t already, weigh out the cocoa butter and shea butter. Cocoa butter smells like chocolate! Even though the weights are different, the actual volumes of cocoa butter and shea butter won’t be that different so don’t be surprised when the two amounts look pretty similar. The cocoa butter is on the left in the photo below. 2. Set up a double boiler and add the cocoa butter, shea butter, and almond or coconut oil to the inner pot. Gently heat, stirring occasionally, until the butters are melted. This should only take about 5 minutes. 3. 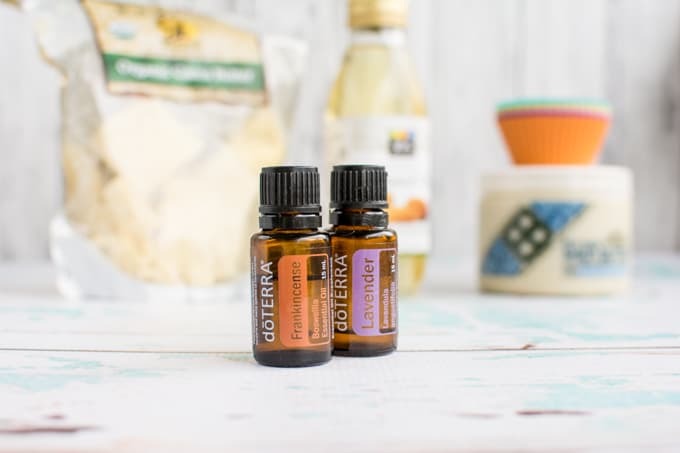 Remove the inner pot from the double boiler and stir in your essential oils, if using. I used 7 drops of lavender and 3 of frankincense. 4. Carefully pour the melted mixture into your molds. To make cleaning your pot easier, wipe the inside clean with a paper towel while the pot is still warm then wash away the last residual film with hot water and soap. 5. To speed along the solidification process, you can place your filled molds in the fridge! Just be careful when moving the filled molds. 6. It will be easy to tell when the bars are solid because they’ll go from amber-colored and transparent to solid and milky-yellow. When they’re ready, pop them out of their molds and enjoy! Store the extras in an air titght container or ziplock bag until you’re to use them. 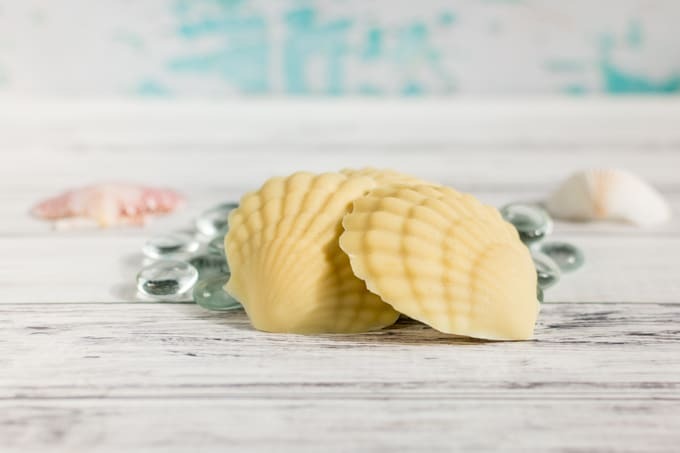 Even with the essential oils, you can barely smell them in the finished lotion bar because of the yummy scent of cocoa! It’s both awesome to have you hands smell like chocolate and a little bit maddening. Wouldn’t these make super cute gifts? Who else prefers to give handmade gifts, whether they’re homemade, too, or not? About how many lotion bars would this make (if using the muffin silicone mold or a standard soap size mold)? Thanks! I made these so long ago I can’t remember for sure, but I believe the overall volume of liquid was about 1 cup. If you know the volume of your molds you can scale the recipe up to make as many as you’d like! I hope that’s helpful. Hey so I made these and it looks like the cocoa butter and Shea Butter are separate. Like the centers are the crumbly cocoa and not uniform throughout. Anything to help with this?